Thanks for that, Russell. I appreciate you taking the time to respond. Seems to be a bit of the old concrete v abstract going on here. The triangular motif was never going to fly in such a literal culture. It's going to be a contest between 'the fern' and 'the flag', which in its current iteration is a concrete noun. I know what you're saying, nzlemming, but I can't help myself. I will advocate, explain, and defend PV / STV at every opportunity. the current anthem took over slowly from god save the queen, and the te reo version is gradually becoming predominant. so let’s just keep flying it. It's a flag, after all. for those who have missed that joy, I commend rewinding Mr Hooton's twitter feed to Dec 11 and earlier. He does have a point about some people slagging the majority as stupid, but it isn't calmly made, let's say. I hoped for Red Peak but on reflection the outcome was appropriate. I liked Red Peak because it was modern, intelligent, innovative, bold and progressive. For me it represented the NZ I aspire to have. The artwork and the narrative that quickly grew around Red Peak, revealed what it might become for NZ. But in truth the Kyle Lockwood flags best capture contemporary New Zealand. They represent minimum viable change. 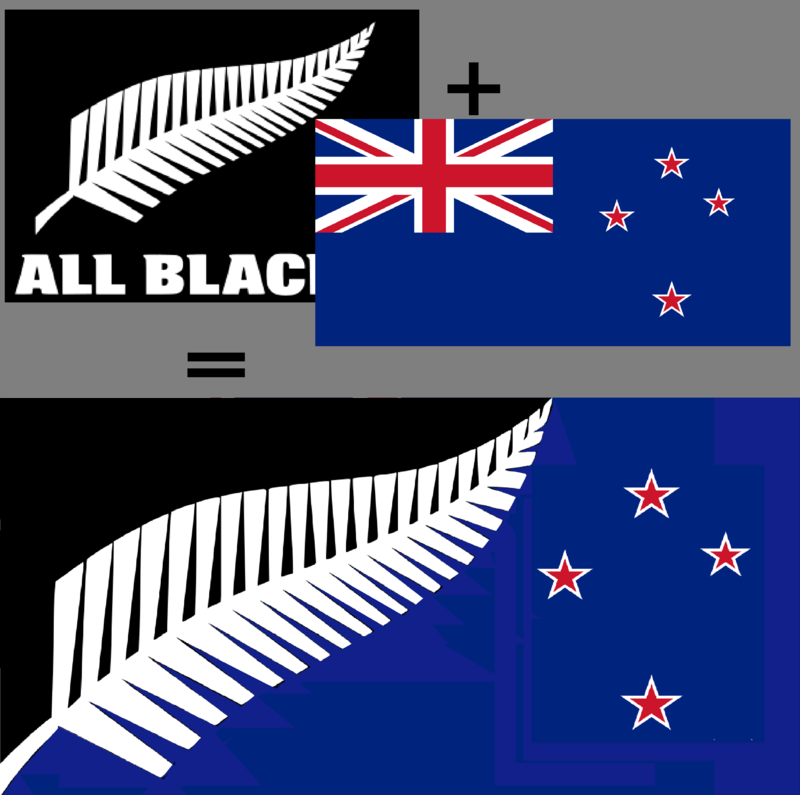 They are virtually an unadulterated cut and paste of the all blacks logo over the union jack on the current flag. In some ways the Kyle Lockwood flags represent no change at all, which is why they got through. I hope Red Peak can now become a standard for those who aspire to realise NZ's potential, and create something better. I was an informal and it was a protest against the fern’s denigration. Take me out of your maths. I'm including informals (so your vote) in the 21% who voted against a fern (even though some may have been supporters of a plain black flag with fern). There were 1,527,042 votes received. Of these, 1,204,993 chose a fern as first preference. That is 78.9% - a massive majority. To put this in further context, in the last general election, there were 2,416,479 votes cast. The votes cast for a fern-based flag represent 49.9% of the 2014 general election vote, more than won by the National Party. Do you see how haughty and arrogant that makes people towards their fellow citizens when they attack so pretentiously the fern-based designs that so many people chose? And also out of touch with the country in which they live? I think the fern v Union Jack vote next year will be much closer than most commentators are suggesting. For the fern to lose, turnout will have to exceed that of the 2014 election, and pretty much all the non-voters in the first referendum will need to back the Union Jack. it isn’t calmly made, let’s say. It was perfectly calmly made. You are assuming that all fern voters will go on to vote for change, which seems highly unlikely. Lord Haw-Haw of the Grammar Zone. best to call it frond imaginings and leaf it there. Your entire argument seems to consist of a demand for people to change their opinion of a design to fall in line wth the majority. You haven't engaged with a single practical, aesthetic or social concept explored in the post. It's getting more than a bit dull. US citizens specifically "pledge allegiance to the flag", not merely to what the flag represents. While NZ soldiers have fought under our current flag, AFAIK it's understood as being a symbol, not an entity in itself. Maybe it's time for some Pete Seeger. The flag is not clothing, unless you're Australian. Fifteen years ago, during the first week of the Sydney olympics, I was waiting with the crowd on the ferry for the gangway to be put in place at the Manly wharf. Off to my left I noticed a middle-aged guy in full tourist kit, Akubra-style hat, souvenir t-shirt, bum bag, the whole bit. What caught my shocked attention was his face. The whole right side appeared to be a mass of hideous deep blue bruising, with patches painted with red mercurochrome. Whatever horrible thing had befallen him, how come he wasn't swathed in bandages like the Mummy? Then I noticed the white stars. He'd had himself face painted with the Australian flag. He’d had himself face painted with the Australian flag. Hi Russell, thanks so much for the words on my article, as I enjoyed your take on the artistic merit. Valid point on London. I might add that I didn't think most supporters thought it was going to win, more that they wanted it to win, but can see how it might have come off like that. To me, the sheer margin of defeat - regardless of abstentions - indicates to me that in the end Red Peak didn't appeal either to the public at large or as an alternative to those who didn't like the Lockwoods. Though right it did have the greatest public visibility through media, viral memes, and the proliferation of flag merchandise, in this regard Red Peak appeared to have more in common with a funky shower curtain or fridge magnet from Iko Iko than a flag so can see why it wasn't to everyones taste. I strongly agree with your point about NZ's history of original, artistic design output - with Red Peak being a good example. The decision making process (?) of the Flag Consideration Panel clearly did a disservice to artistic consideration and hopefully a future panel under another government would be empowered with a bolder mandate, vision, and process. Of these, 1,204,993 chose a fern as first preference. That is 78.9% – a massive majority. Are there any reasons to prevent the Electoral Commission from releasing the complete voting configuration for all ballot papers, instead of just the count summary? The ballot papers themselves get destroyed, but the data from them probably went into a counting system. There's a presumption by many that everyone who liked either Lockwood design preferred the other straight after. Yeah, probably, but I'm curious to see if this is true instead of just declaring that it's true without actual evidence. The nature of how the count works means that the result summary doesn't show what those 1.1 million people's second preference was. Even then, that’s only an abbrieviated (and conveniently lossless) method of simply publishing every vote. If there were more options and an order of magnitude more combinations, there are still no more than a few million votes in total. A file or spreadsheet with a few million lines to indicate the combinations of each vote is not a massive undertaking for any random person to process in this day and age. From memory the Electoral Commission sometimes doesn’t publish election count details from polling places with very small turnout if there’s a concern that it might let a person with their vote be identified. Fair enough, but is there any real risk that a particular preference combination out of 1m+ in a postal ballot could be traced back to a specific individual? Unused preferences are not analysed and hence not recorded - obviously doing so would take time and not affect the actual result. The same process is used for other STV elections. You could have made a submission advocating that additional analysis was done and published when the bill went to Select Committee. Oh, were they counted manually, then? Somehow I'd imagined that there would be a digital scanning process with any ambiguous ballot papers then being diverted to a real person. I'm not sure - it would seem hard to have done a manual count in the time available. So maybe they could analyse unused preferences at no real cost. But it's not legislated for - I'm not sure if that would make it illegal for the Commission to perform that analysis - my guess, given the prescriptive nature of the process is that it would.